In an effort to fall back in love with comics, Alex has decided to go back and read all of the old books that made him fall in love with the medium in the first place. Today, Alex reviews Sam and Twitch: The Brian Michael Bendis Collection, Volume One, from Image Comics, written by (you guessed it!) Brian Bendis, and with art by Angel Medina. Welcome to the longest-titled post in our humble blog's humble history. This time around, I made a game-time decision to keep Bendis' Daredevil run on the bookshelf for the moment, and instead I decided to mix things up a bit with this offering from Image Comics. First and foremost, it doesn't matter if you have no idea who the two characters in the book's title are. I didn't, either, when I picked this trade up. And, honestly, these are the only stories with the characters that I've ever read, and probably will ever read. All you need to know is that Sam Burke and Twitch Williams are New York City Police Detectives and they exist in the world of Spawn, Todd McFarlane's 1990's-era blockbuster creation. Really. That's it. I promise. This collection encompasses the first of two arcs in one of mainstream comics' very best crime fiction runs, with some of Bendis' very best, patented dialogue. 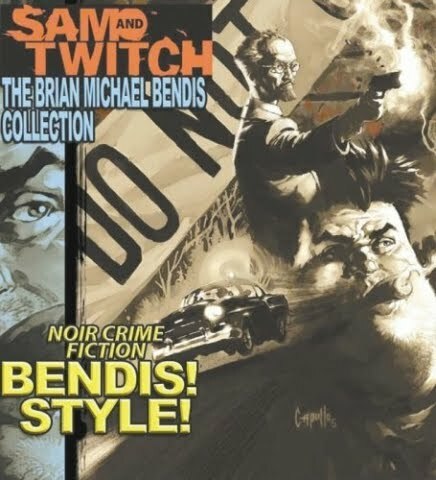 The second arc of Sam and Twitch stories appears in a volume two collection of Bendis' work on the title, and while I won't be reviewing that book in-depth, I will give it a very high recommendation once you've read volume one. So, back to volume one, then. This tome collects the first nine issues of the title, and clocks in at $24.95. A good price for the high quality package Image presents for fans. The main story in volume one, entitled "Udaku," moves at a lightning clip, and reads like an old-fashioned, hard-boiled crime saga should. It's funny that the action moves so quickly, though, since this is something that a number of readers will find as contrary to Bendis' usual take on funnybooks. There are some fans (online, of course) that criticize Bendis' knack for telling six-issue stories that read better when they're collected in a trade. Clearly, that's the way of the industry, and I don't think it should be held against any writer working in this most current comics landscape. Still, I totally get how some complain about the overly-talky characters and the single issues that cover about ten minutes of time. Personally, I like talky comics, and I enjoy reading books that take place in "real time," and Bendis' is one of my favorite voices in all of comics. Anyway, back to Sam and Twitch. And, specifically, the art on Sam and Twitch. Angel Medina's pencils seem to...move...somehow, from one panel to the next. I know comics artists are supposed to imply movement of characters and cars and things, but, man. Medina is so good that there are times when you'll swear a character jumped right into the next panel. There were several points in the book where I made a note to myself to go back and take a closer look when I was done reading. I wanted to try and study the pencils, and to see how and why they seemed to leap from the page. Medina mixes it up between very structured layouts and these really beautiful, really complicated panel arrangements that are so unique that I'd even venture to say this book is worth the price of admission for the art alone. Of course, there's also a killer story here from Bendis, as Sam and Twitch have to track down a brutal, and seemingly supernatural, serial killer. Newly returned to the force after quitting in protestation over an influx of crooked cops and bad deals in the department, the charismatic and uncompromising partners find themselves in the middle of the most dangerous case of their careers. They come onto their first crime scene since getting back to find a bunch of dead mobsters, and four severed thumbs. Pretty formulaic mob stuff, yes? Um...no. The four thumbs all belong to the same person, and it becomes Sam and Twitch's jobs to find out how in the world that's possible. The "Udaku" storyline is filled with solid storytelling, crisp, crackling dialogue, and enough detective work to make Bruce Wayne jealous. Fans of Ed Brubaker's Criminal series, or any of Bendis' early indy work such as Jinx and Goldfish will certainly find plenty here to enjoy. So, here's the deal, folks. Sam and Twitch, volume one--and later, volume 2--are just flat-out good comics. And you have to remember that these books were coming out month-to-month in the late 90's during a time when comics were an all but dying industry. It was work like this that led to Brian Bendis' rise in mainstream comics, and after reading this trade, it'll become apparent why he was in such hot demand so soon after the issues were finished. Bendis will always be known for bringing a new and unique voice to comics, and for helping to change the course of Marvel's history. If you're a fan of any of Bendis' current work on titles like New Avengers, or Powers, or Ultimate Spider-Man, but you might be experiencing even fatigue in super hero universes, then do yourself a favor and grab a copy of Sam and Twitch. And here we are, two weeks gone since I declared my growing cynicism for the comics industry. So far, I've read several of the books that got me into this hobby in the first place, and I've reviewed Batman: The Long Halloween and Dark Victory, The Copybook Tales, Hellblazer, issue 27, and now Sam and Twitch, volume one. Coming next week, I'll talk about whatever I find time to read over this Thanksgiving weekend. I'm thinking it'll be something more mainstream, like Frank Miller's Batman: Year One, or maybe even Jeph Loeb and Jim Lee's Batman: Hush. We'll see, though. For the moment, I'm very happy with the fact that I still enjoy reading these books, and that there's still a deep appreciation of the art form when I crack the spine and sit down with them. I really couldn't care less about if/when Bruce Wayne emerges from his cave at the end of the world, though, so the whole new comics thing still isn't working so well with me. I'm still willing to give it time, and to maybe use all these negative feelings as a positive. I think sometime next week, I'll do a post about all of the titles that I was typically reading every month, and I'll run down where I stand with them presently. I'll go through which books I still buy, and why, and which books I've dropped and/or I'm thinking about dropping. For now, happy Friday, everyone! How Do You Remake a Classic?